Register for our Patient Portal to access your child’s health information online. Want to access your child’s health information? – Login to our Patient Portal. Our Patient Portal gives you secure, online access to your child’s health information. 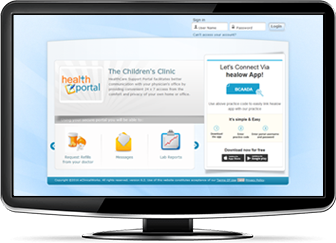 Patient Portal is a secure, convenient, and easy-to-use website that gives you round-the-clock access to your child’s health information. With Patient Portal, you can view labs, medications, immunization records, statements, and much more. Having online access to this information puts YOU in control of your child’s health. Click below for online health access. Online health access is also available on your smartphone. Along with the features you get with the Patient Portal, the healow™ app can manage multiple accounts (all family members), set medication and appointment reminders, and use trackers to help manage their health. The healow™ app is a secure and convenient way to manage what’s important and puts YOU in control of your child’s health. healow™ is free and available on the Apple app store and Google Play store. 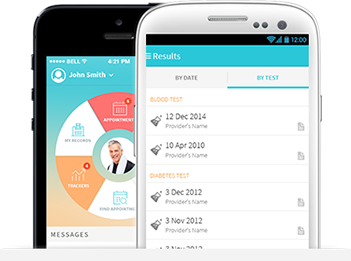 Download the healow™ app from App Store (iPhone) or Google Play (Android Phone). Enter your portal username and password to log in. Search your practice by entering practice code – BCAADA. Set up your PIN to securely access your health records. Use this code to search The Children’s Clinic on healow™ app. Do I have to pay to get access to Portal and healow™ app? Access to Portal and the healow™ app are completely free. We share this information with our patients to acquaint them with their children’s health and how to make better healthcare decisions. Yes, the information is completely secure. It is protected with a username and password / PIN number of your choice and through SSL encryption, making it as secure as online banking. What can I access through the mobile app and Patient Portal? We share information with our patients that we feel can help them and keep them informed. Every practice is different, and we try to provide patients with key aspects of their children’s health. For a complete list of features, ask our friendly staff. Signup is simple and outlined in the steps above. You should receive a username and password from our practice via email that you can print out and customize after your initial login. Access can be made via any web browser, or through the smartphone app. The app and the Portal have functionalities that allow you to reset your username and/or password. You can also call the front desk and we can reset the username and/or password for you.